Ancient India has celebrated Henna patterns and women in our country paint their hands with henna on every happy and auspicious occasion. 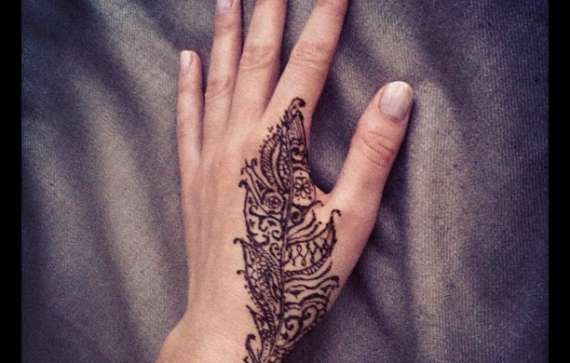 The popularity of henna has reached the overseas and people over the world have embraced this beautiful form of a temporary tattoo. 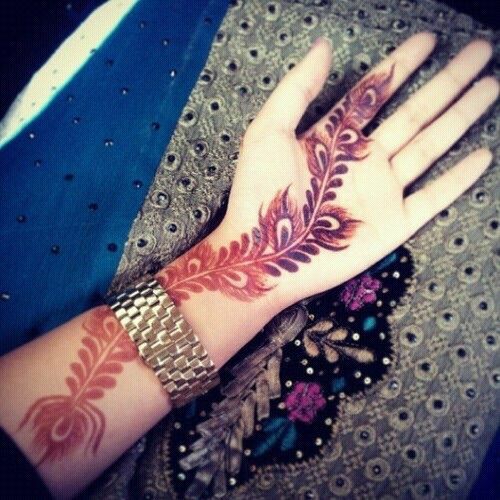 Mehndi has a cooling effect and the stain it leaves on the skin has mesmerized the masses. It has gained popularity throughout the globe. 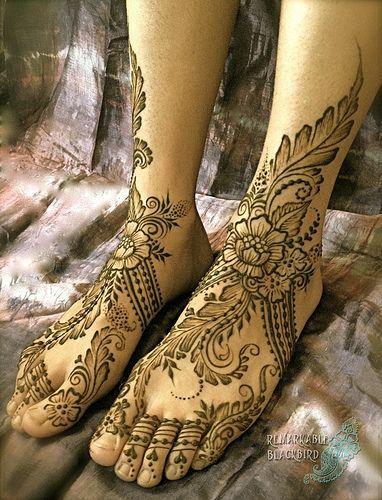 Not just Indians but a lot of western countries have embraced the art of henna applied on hands and feet. 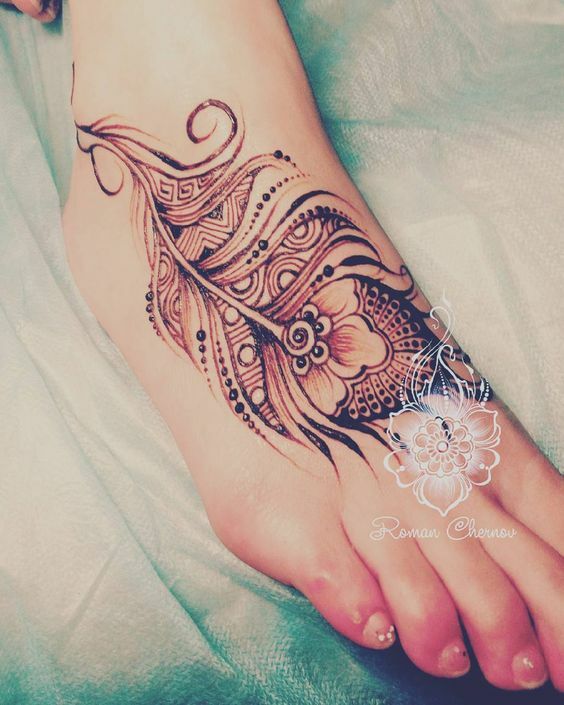 The use of mehndi to decorate the hands and feet of a women has gained popularity and women from different cultures and spheres of the world have spoken on how much they love the art of henna. Mehndi is loved by women of all ages and even a favorite among kids. 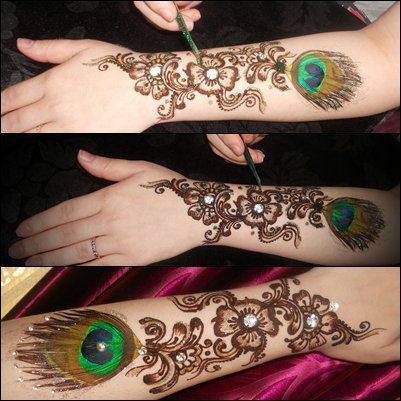 Henna Mehandi patterns have the power to transform your hand sand feet to a whole new level of beauty. It enhances the beauty of your skin by staining it and takes your whole look to another level. In India no bride is complete without applying henna mehndi on her hands and feet. 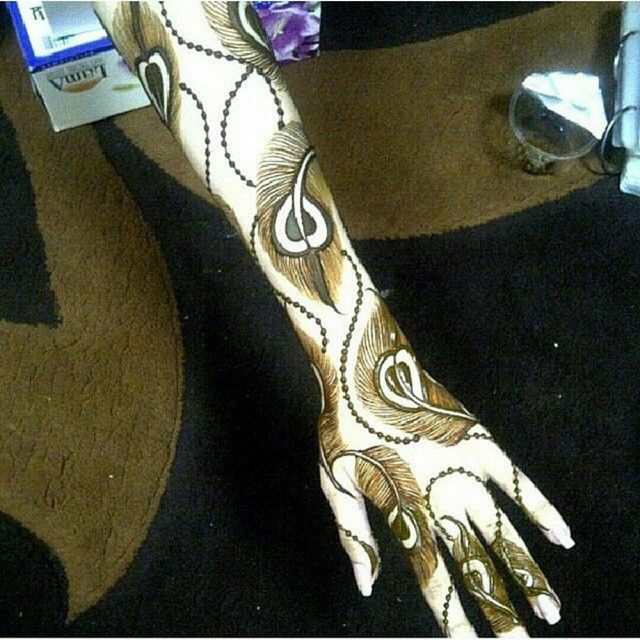 Changing times and fashion forward mindsets have created a lot of new mehndi patterns that the youth can relate too. Creativity has lead to the making of a number of sunning henna patters like henna feather, shaded mehndi designs, Moroccan geometric prints and colored henna. Current hot favorite is the 'Henna Feather' pattern. With henna patterns mostly covering full hands and feet it was considered ideal for married woman or for those who wanted to go for a glamorous desi look. But when a feather was drawn with a henna mehndi cone, the young aged girls loved it and wanted to flaunt the feathered patterns on not just their hands and feet but on their exposed skin. It became a symbol for the youth. With henna being a temporary stain, the youth wouldn't have to worry about parents or teachers complaining about them getting tattoos at such a young age. 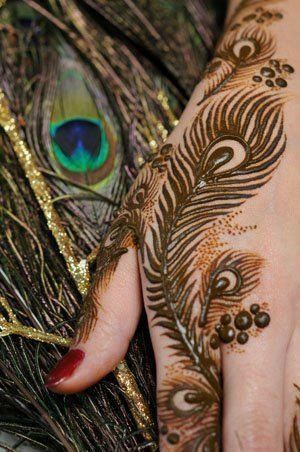 Even though the henna feather had a young vibe to it, the most important aspect for its popularity was its symbolization and how easy it was to connect with the feather motif. The feather motif holds a great meaning for a lot of cultures. Feathers have assumed great symbolism, the most famous being free spirited along with bravery, accomplishment and freedom. 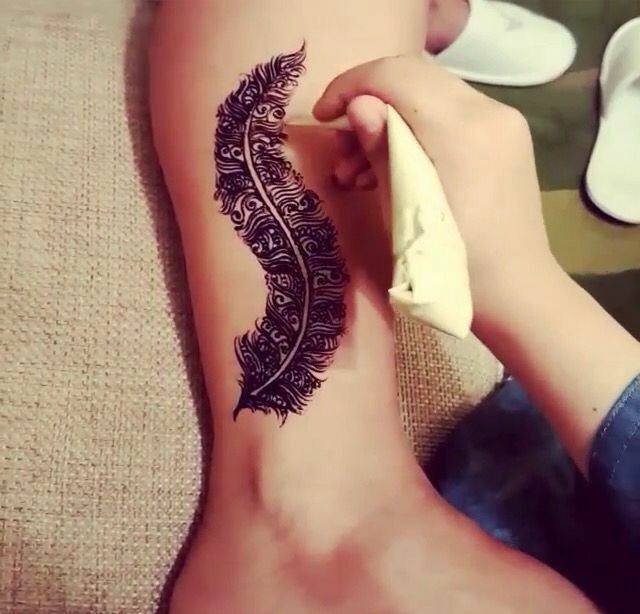 The henna feather is also very popular with white mehndi designs which is usually very different from the traditional henna and is done with acrylic paint. The henna feather patterns has a Indo-western touch to it, just like henna belongs to ancient India the feather motif is a spiritual thing in the western side of the world. When both the things combined , a fusion and a very modern outcome was formed. 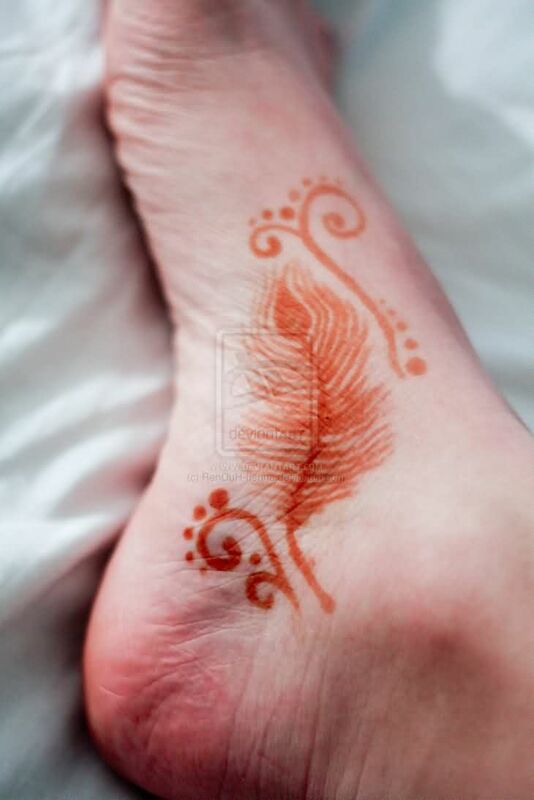 The Henna Feather has been a symbol for freedom and women can very well relate with it. 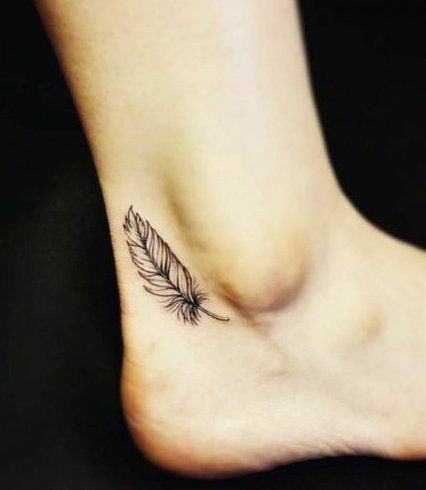 Feathers are very feminine and breezy and have a very optimistic feel to them , which is why women tend to get the henna feather tattoo quite often. The henna feather is a favorite among Asians and Americans for they are very versatile and look good on everybody be it a 40 year old working woman or a 15 year old girl. Feathers have long held many meanings for many cultures. 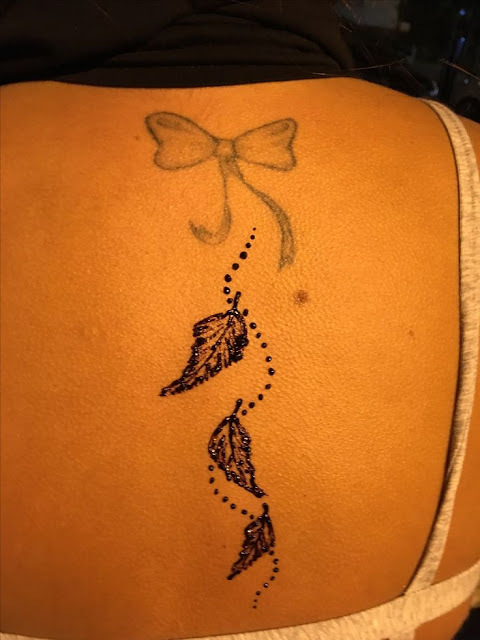 Women can easily connect to this free spirited pattern and they get it drawn as they feel the henna feather pattern defines them and makes them believe in themselves. The symbolic significance of a feather is so strong that when drawn with henna on a woman's body , it turns into an inspirational message . Many of the women get a henna feather drawn as they believe that it motivates them and looks very chic. 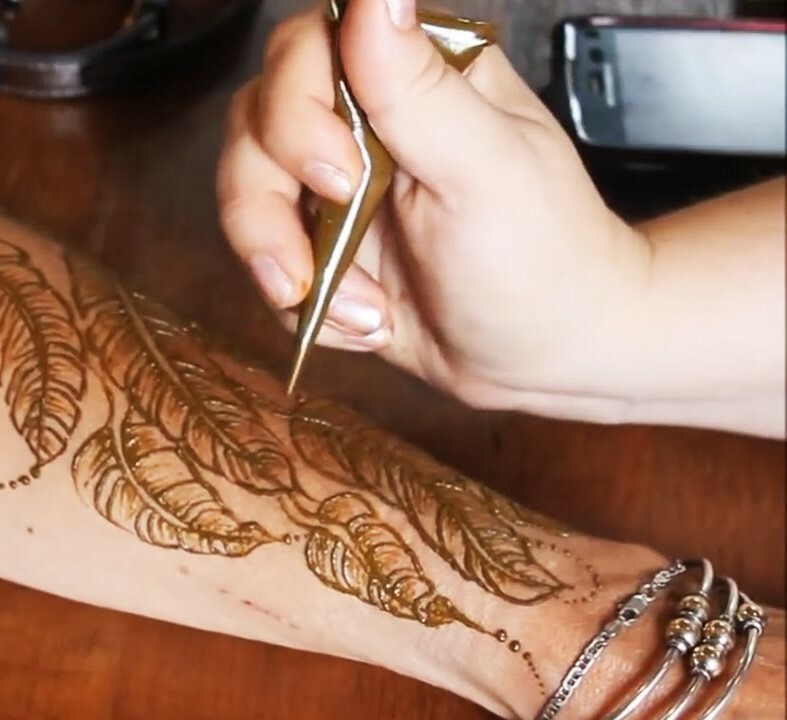 The traditional form of mehndi like Pakistani Mehandi Designs and Arabic mehandi designs might be very popular but the Henna Feather is soon going to join the likes of the traditional way of drawing mehndi. 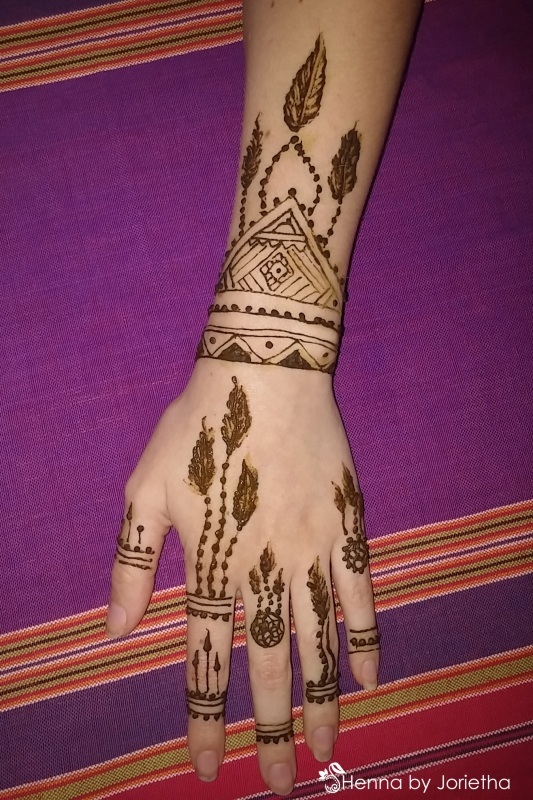 Plus the henna Mehndi doesn't require as much time as the traditional mehndi requires , which can also be one of the reasons why woman in the west go for a simple henna feather pttern than a full fledged traditional mehndi pattern with no spaces. The henna feather is not widely used in the traditional mehndi and the most used henna feather motif in a traditional form of mehandi is the peacock feather. As the peacock feather has an ancient relationship with the Indian culture it is considered auspicious and hence the peacock feather is a favorite in the traditional form of mehandi. The 'bird' Peacock is one of the most beautiful birds found in the whole word. Being the National bird of India , its always a delight to watch the Peacock dance when its raining. As beautiful as the peacock is, its feathers are even more beautiful. i always collecting peacock feathers when I was in school. The last time I witnessed a peacock dancing with its feathers open wide was from a moving train and I was knocked off by its vibrant beauty. A peacock is blessed with natural beauty and its feathers have a special place in our ancestors libraries and have been considered royalty and nobility. The peacock feathers are lovely and are used for decorations as its a symbol of beauty and luxury. The peacock motif is everywhere in the fashion world today. As peacocks originally come from India, the most famous and widely used henna feather pattern in Indian mehendi designs would be the peacock feather motif. Peacocks remain a popular motif today, and when you don't want a full peacock , a simple peacock feather is enough to to beautify your hand! The peacock feather is a beautiful representation of beauty and elegance . Even though the peacock motif is the most famous motif , the next famous henna feather motif in India would easily be the Peacock feather motif. The peacock henna feather motif is wan absolute favorite with the Indian brides as it looks very sophisticated and delicate when drawn on a bride to be's hands and feet. The peacock henna feather is considered to boost the self confidence of a newly wed bride and along with that it beautifies the hands and feet of the bride giving her body an external glow. 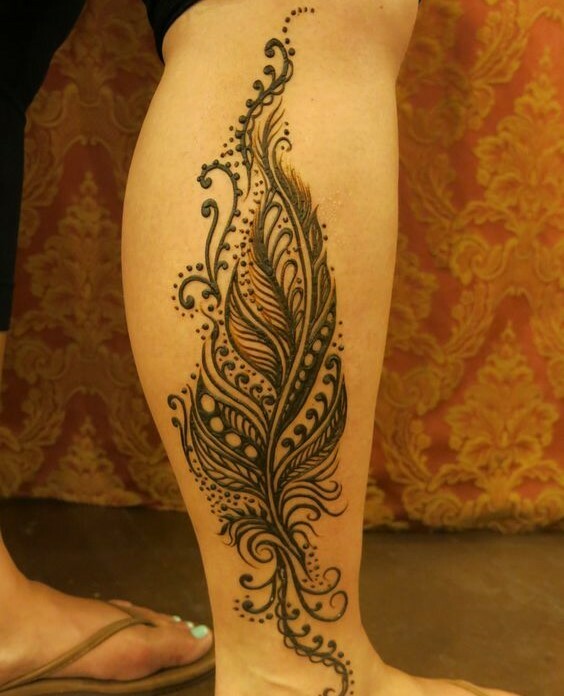 the peacock feather tattoo is also a form of seduction and sensuality and hence it can be understood why its popular among the brides. 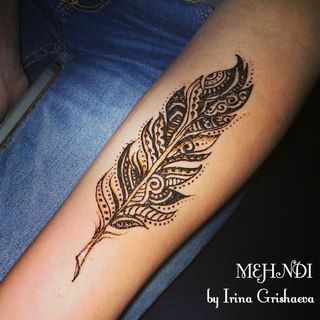 If you are a kind of person who is done with leafy patterns and floral's then a feather henna mehandi design is the way to go. Further a feathered pattern in a Moroccan mehendi form is the best option. 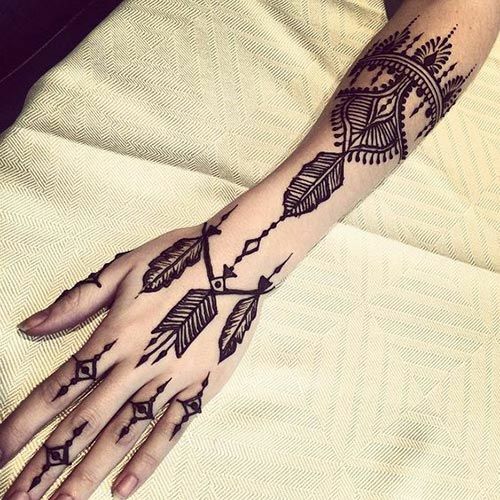 Geometric lines, tribal figures, dreamcatcher and small feathers make this particular henna feather mehandi design a big HIT! 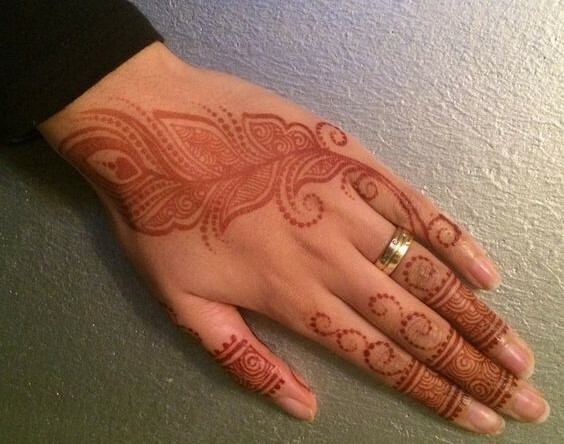 This beautiful henna pattern has a ring like design with a trail ending with a feathered pattern. it looks lovely on the back of the hand and is a great option for those who like it minimal and clutter free. 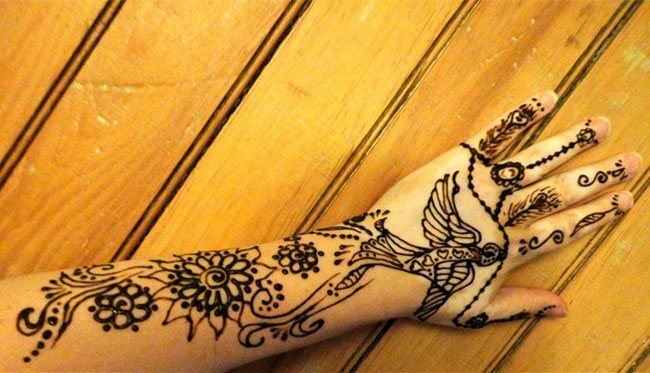 In this particular creative free hand henna feather pattern the bird itself is drawn along with feather motifs on the fingers. This is very unique and unlike any design I have come across. This is a very beautiful and creative design for those who love filled up shaded patterns. The design for the back side of the hand is fancy in its own way with intricate & unique design. With this particular design you could give your hands a modern yet shaded look! 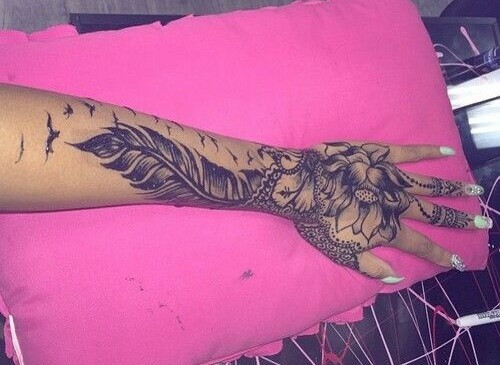 Further the combination of flowers, feathers and birds make the henna feather design simply unique. 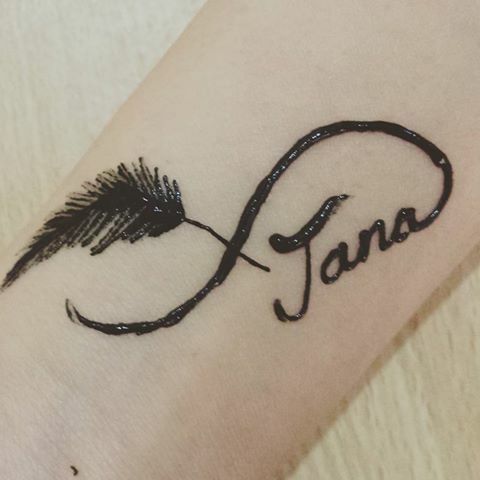 This henna feather pattern is one of the most popular henna patterns throughout the world. Its a simple yet timeless, elegant tribal feather design which looks absolutely stunning when done on the hands, forearm or lower leg. 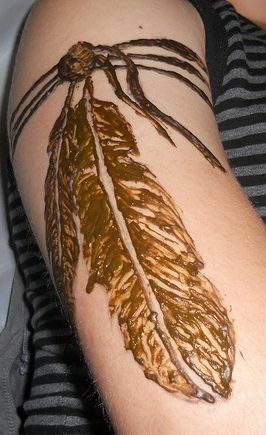 This is one is easier to draw and an amateur can also try this pretty tribal feather henna pattern. A feather emerging out a quote is a trend nowadays ! What is not there to like about this gorgeous simple henna feather tattoo? 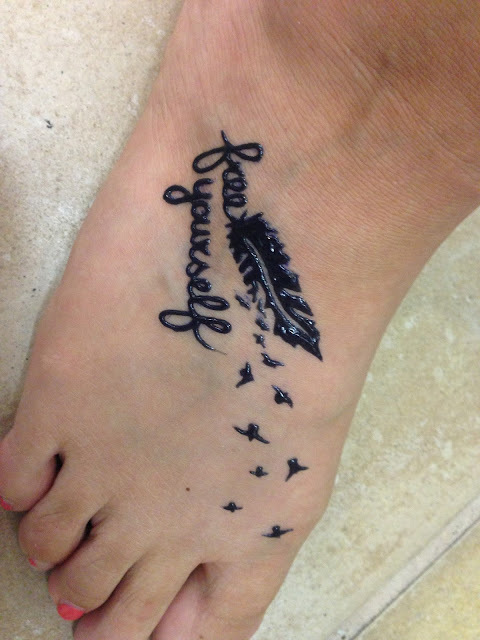 This particular with the quote 'free Yourself' is an inspiring one and a great option for those looking for some motivational temporary tattoo in their lives ! A delicate bracelet like design is drawn at the wrist which is further extended with jali like patterns and the ends are finished off with delicate small feathers ! LOVE ! Most of the legends believed that the leaves of a tree and a feather , when combined together had great potential as the leaves are a sign of dynamic growth and the feathers a symbol of self development and freedom. 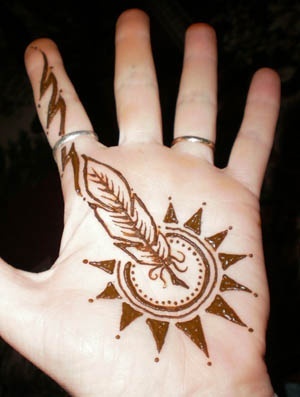 This also makes for a pretty pattern on the hands and is widely used in the traditional form of mehndi . Less complicated peacock feather designs are setting a trend nowadays. This modern design with graceful beaded curves look versatile and go very well with contemporary outfits. 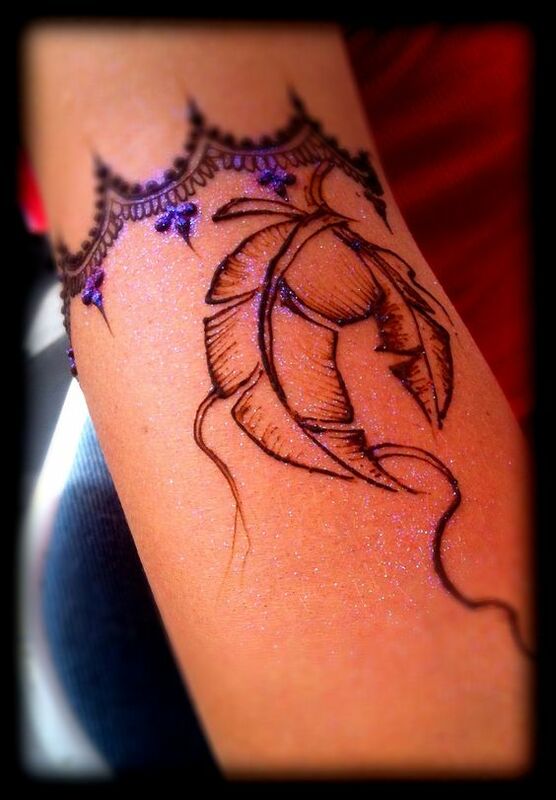 Light shaded Feathers are strung together in this particular henna mehndi pattern. It looks beautiful on the forearm as it has a very breezy feel to it. The feathers are strung and drawn in such a way that they face each other and look like lovers or sweethearts. You can further add blue or any color glitter to make it even more prettier. 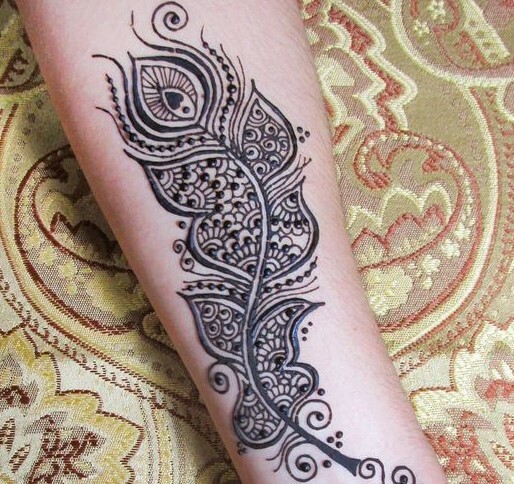 This intricate and beautiful henna feather mehndi design will look beautiful on the arm and needs a little skill as it has intricate detailing done in the inner portion of the peacock feather pattern. What can be better than a mixture of flowered patterns and an addition of real peacock feather at the end? 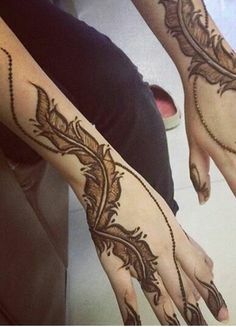 This amazing floral henna pattern with swirls and dark inner shading looks gorgeous on the back of the hand, the best part is that a real peacock feather is stuck at the end the mehndi design. This is really a different one as I have seen very little mehndi patterns which use real flowers for enhancing the beauty of the design. The startling feature of this henna feather pattern is the traditional and modern pattern at the start of the mehndi. It ends with a feather with two wavy strings flowing at each ends. 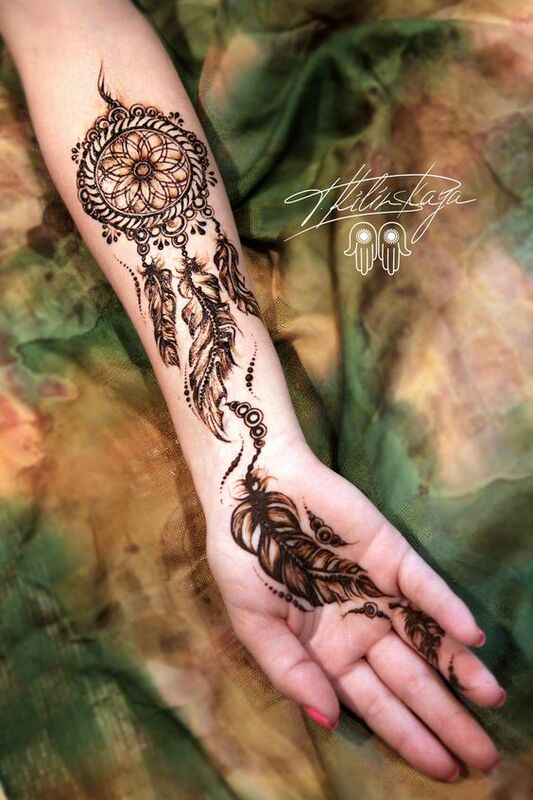 All elements of this henna feather create a beautiful contemporary picture, which looks absolutely stunning when drawn on the arms. 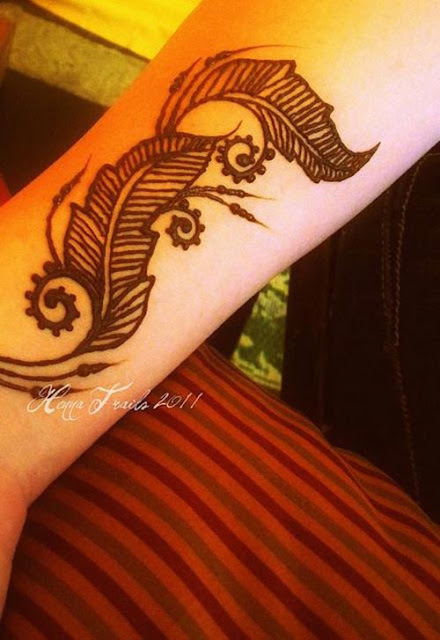 Thick rimmed swirls along with loads of empty space make this henna feather pattern a very attractive design. This design when removed leaves a thick dark stain as it is thickly applied. 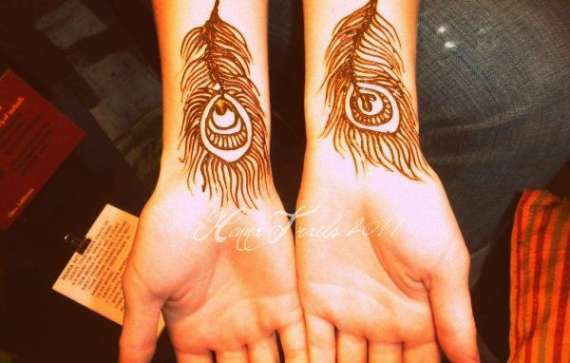 The lovely all seeing eye peacock feather pattern at the end of the henna mehandi means the person getting this henna feather tattoo is not afraid of any kind of difficulties and is always ready to evaluate them objectively. 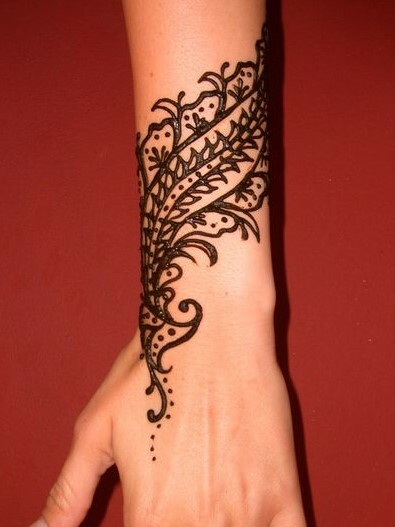 A single henna feather with really beautiful patterns in each stroke makes this a beautiful henna feather design. This looks lovely as its done with a very light hand and is sharp and has no flaws. This pattern has a feather drawn in its real form. 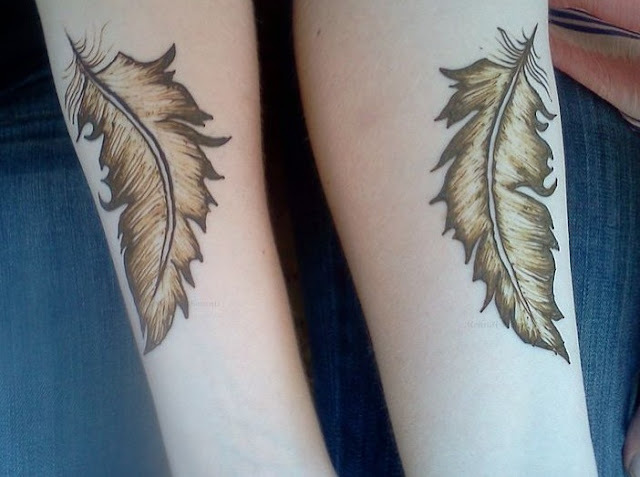 The feather is shaded and drawn in such a way on the forearm that it looks like these have been hung over the forearm. 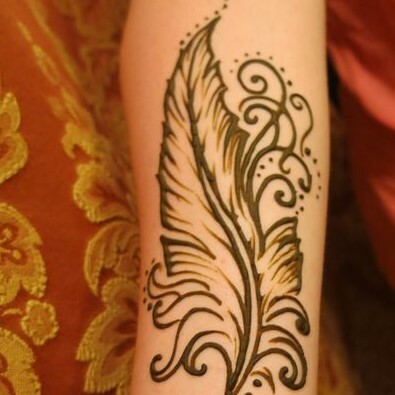 Very pretty and chic, all those who wear sleeveless tops and tunics can go for this henna feather design. 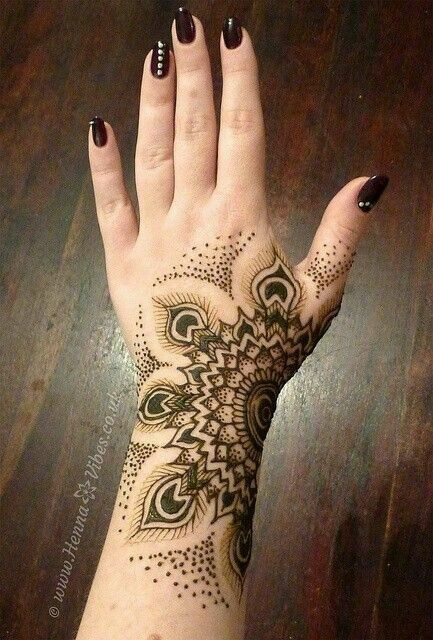 This one is a very beautiful and chic mehndi and would look great for parties. 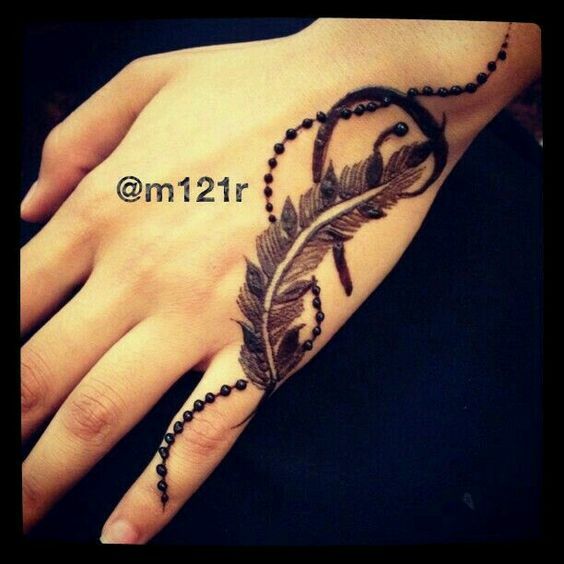 This one is a latest modern mehndi design which has feathers connected to each other in a jewellery form.A bracelet like design is placed on the end of the design, after which intricate details cover the bracelet and feather like chains extend from it.This design has a lot of resemblance to the full arm chain or the elaborate Hathpool, like a hand harness. 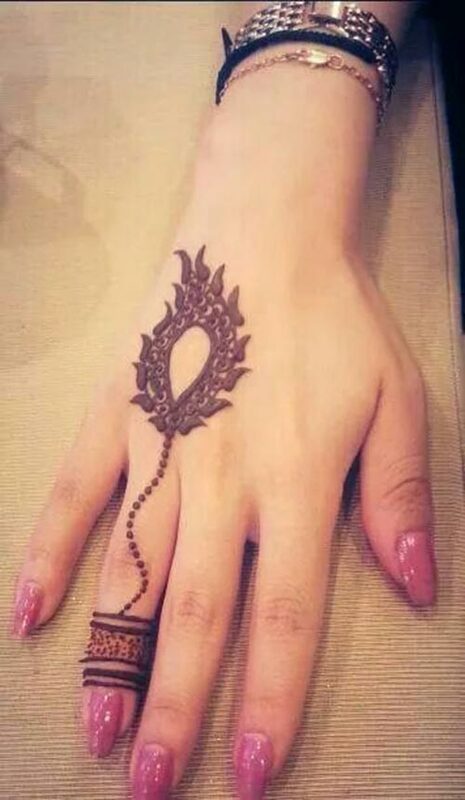 This beautiful jewellery can easily replace the hand jewelry and if you want to skip jewellery you can get this henna feather mehndi design for this itself acts like hand jewellery. 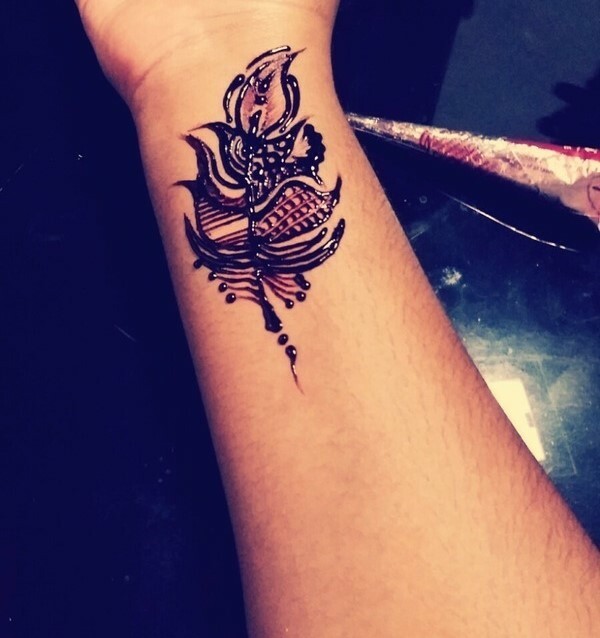 Ver simple yet beautiful, this henna feather mehndi design has half of the henna feather filled with mehndi and the other half unshaded which makes it very differnt from the others. This is a very different and exotic peacock feather henna mehndi pattern. This can flatter a lot of body parts like the back, shoulder and the back of the hand. This is a very creative design with a flower mandala and dotted elements in it. If you are a die hard harry Potter fan and want a feathered tattoo, the famous snitch from the Quid ditch match can be a great option for it has fluttery feathers coming out from both sides. Very beautiful and has a magical feel to it ! 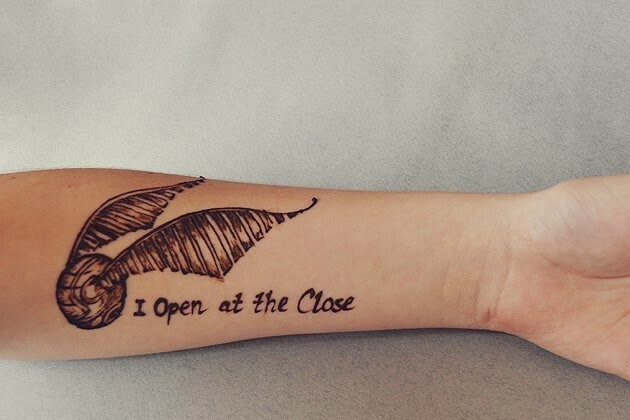 The best part is you can get the words 'I open at the close' under the golden snitch for more effect ! I love the feathered arms this snitch has and it holds a special meaning for potternmaniacs ! 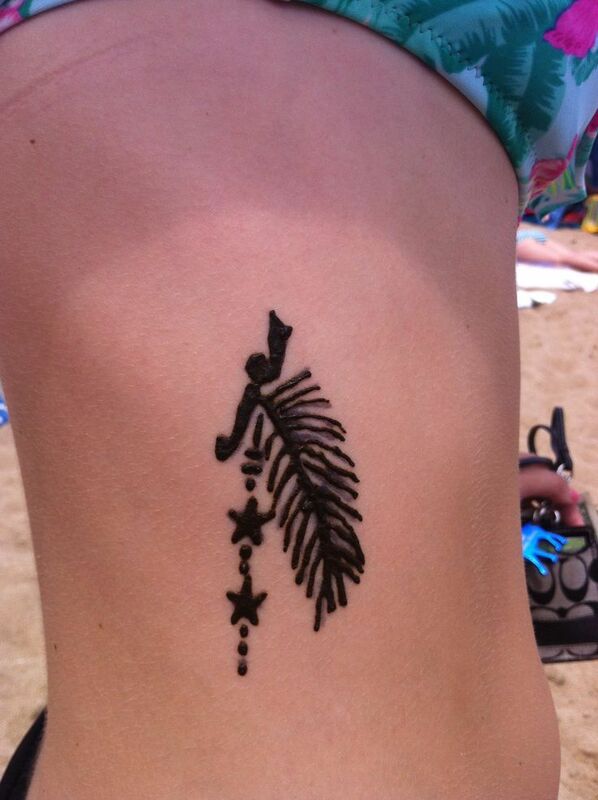 This is a very popular henna feather tattoo among the Boho hippie women. 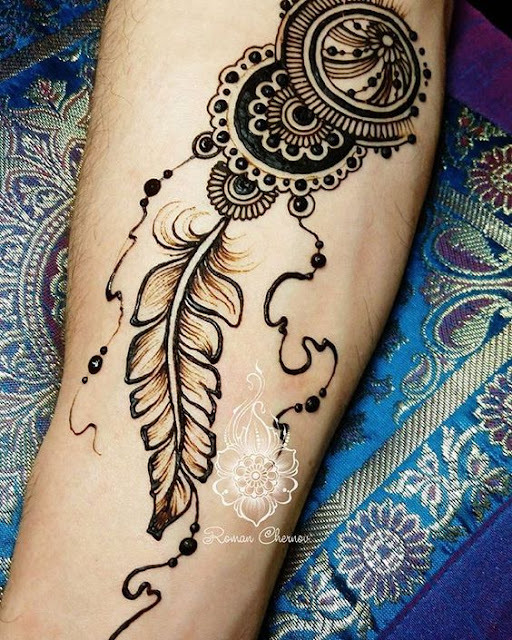 The depiction and symbolization of this henna mehndi feather pattern makes it very versatile for the free living people to get it done on their body! This is a world famous henna feather tattoo for it has a phoenix feather worn like an anklet pattern , the phoenix feather is a symbol of bravery and this is one reason why its popular as a henna feather pattern ! 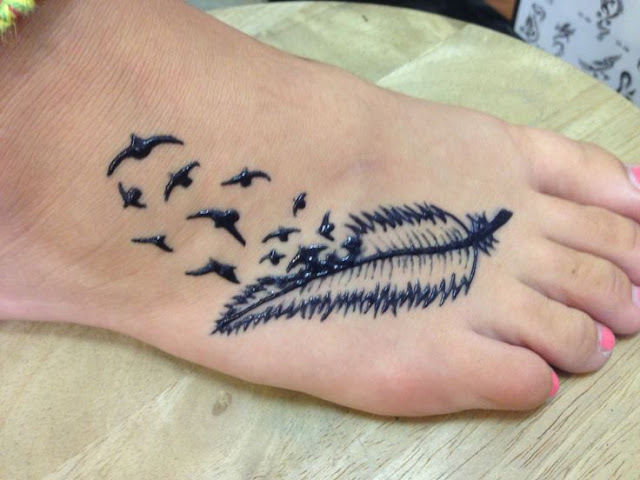 In this simple henna feather pattern the feathers are drawn in a way like they are strung from the beads. Looks very beautiful on the back of your body! 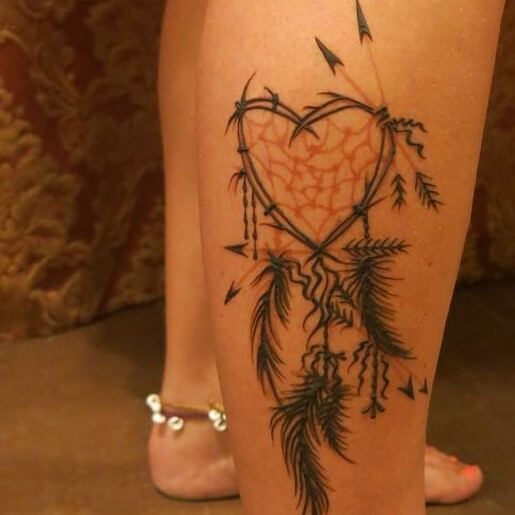 The dream-catcher symbol with feathers and beads is very popular among the women. 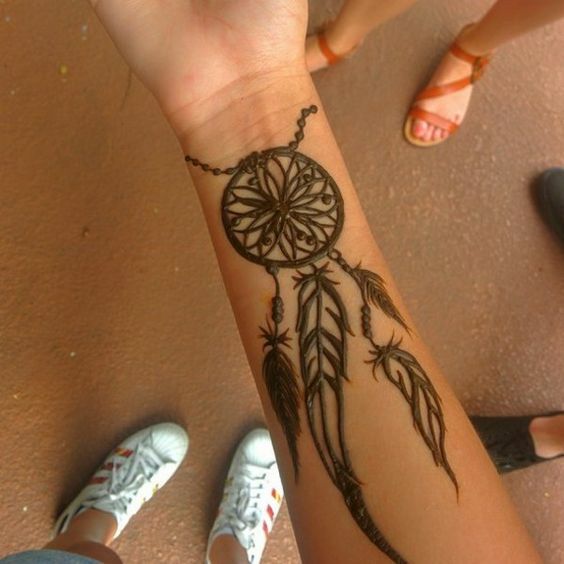 What better than getting a dream-catcher pattern on your arm? 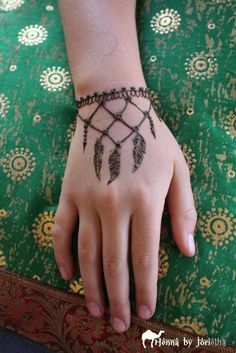 It looks lovely and holds a sacred meaning!This henna feather dream-catcher pattern has the traditional touch for it has a net woven with beads and feathers just like the native American Indians had! 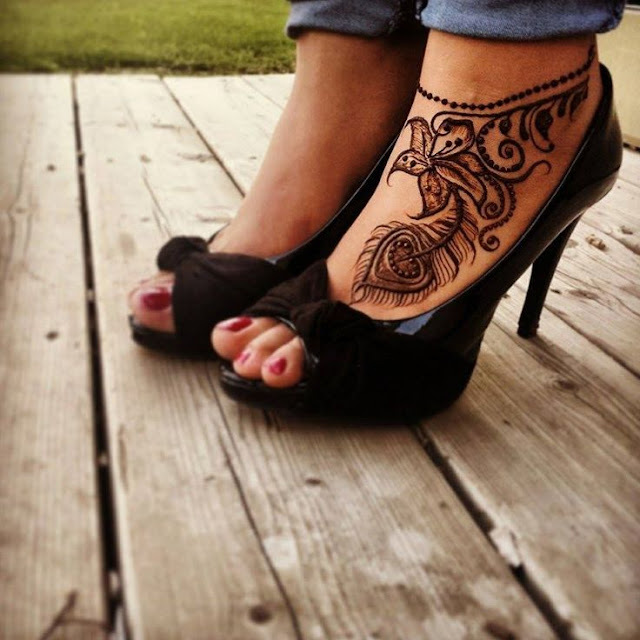 Gone are the days when women had the same patterns drawn on both the feet so they looked uniform ,with creativity syncing in the mehndi generation, it has given birth to the mismatched version! 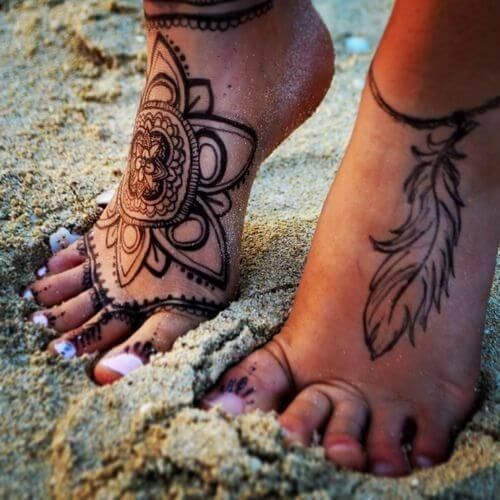 This mismatched version when a flower mandala is drawn on one feet while the other has a henna feather anklet looks so cool ! Those who like to keep it different and hatke must try this modern and latest henna feather mehndi pattern ! This is a lovely feather with very intricate swirls and patterns inside the feather, covering the whole leg this is quite a big mehnedi design. 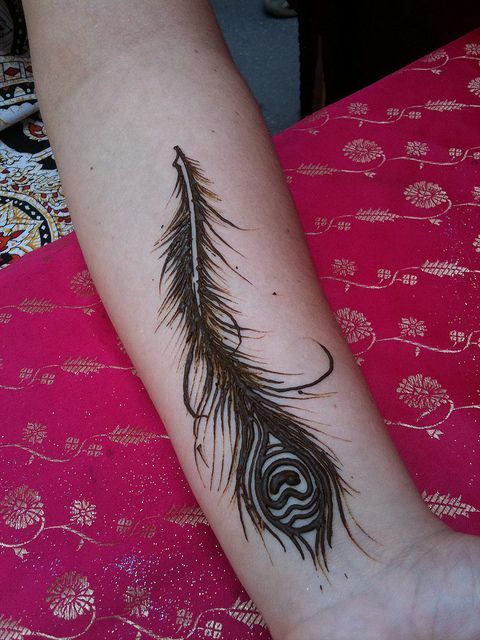 A sharply designed simple peacock feather in the tribal way attracts a lot of people as this is an oriental style henna feather pattern and is believed that this particular pattern rejuvenates the spirit. 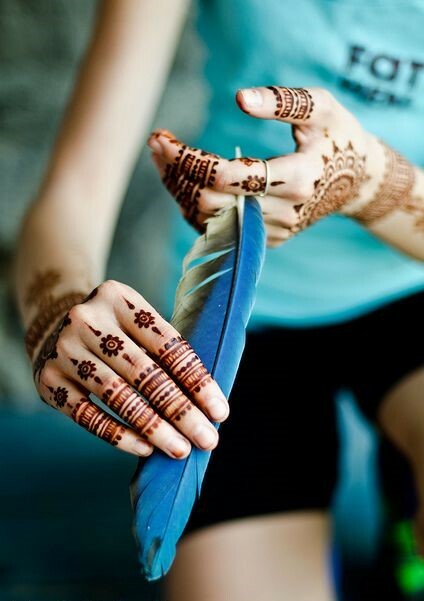 Drawing a quill with a leafy pattern makes it equally beautiful as a mehndi pattern when drawn on hands. The eyes of a peacock feather held deep meaning for a lot civilizations. Indians considered the peacock feather royal, the Chinese considered it lucky and a symbol of arrogance and pride in the Middle ages. This bel like creeper consisting of small peacock feathers is so lovely and has a lot of meaning. It not only looks beautiful but holds special meaning for the person getting it stained. The free spirited and Bohemian women love showing off their amazing yet simple art on their body. 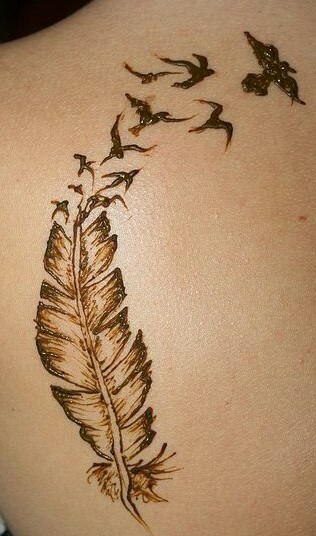 This is a perfect henna tattoo for it has a feather from which birds are shown flying away higher in the sky. 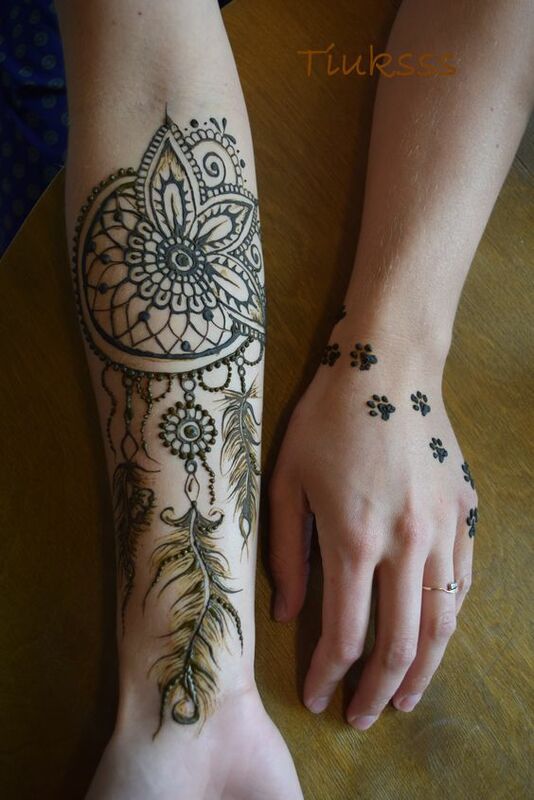 The depiction is very boho and thus a very popular henna feather pattern with Hippies. 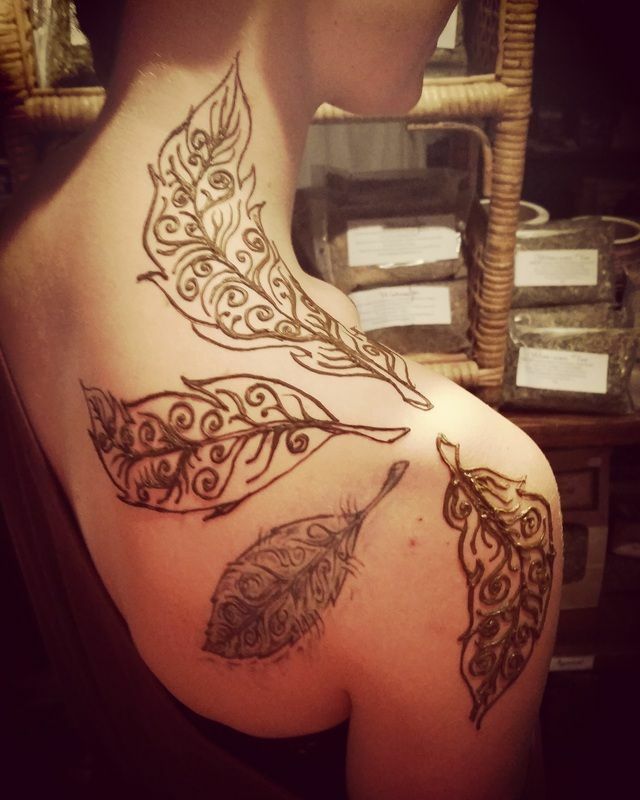 Which of all these Henna Feather Patterns is your favorite? Do let me know . 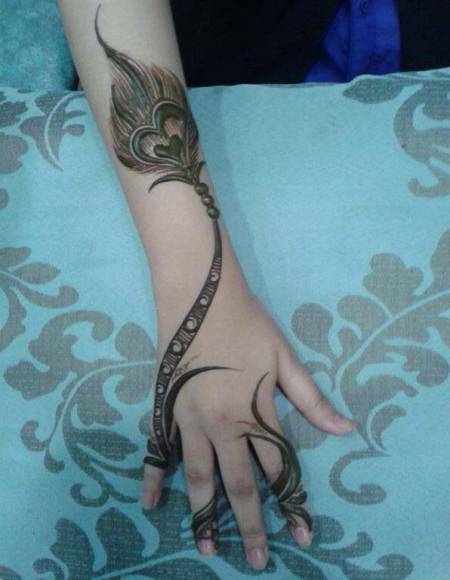 13 Breathtaking bow mehndi designs: Latest mehandi Designs !